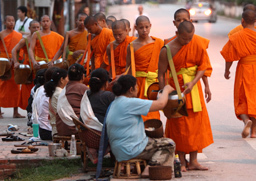 Through the jouney, we encourage to meet and contact directly with the local people of Laos. 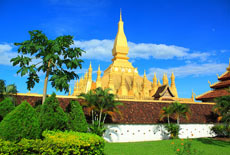 An authentic picture of Laos not to miss! 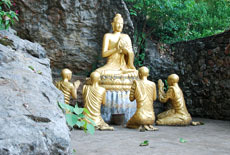 Complete discovery of the capital Vientane - called "moon gate"
Trekking Vang Vieng village along the Nam Song River. 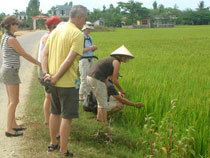 Visit authentic artisan villages and ethnic minorities. 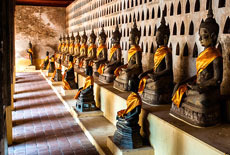 Visit sublime temples of Luang Prabang listed as World Heritage by UNESCO and overnight at homestay . Admire all the wonderful waterfalls of Kuang Xi, Pak Ou caves and swim! 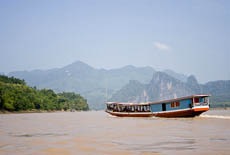 This afternoon, we embark on a cruise upstream on the Mekong River, which also gives us a breathtaking view of the tranquil countryside, before reaching the mysterious Pak Ou Caves, two linked caves crammed with thousands of gold lacquered Buddha statues of various shapes and sizes left by pilgrims. Along the way, we stop at the village of Ban Xanghai, where they make the local rice wine. On return, we disembark the boat to visit traditional villages, and continue taking a short drive to Ban Phanom, a village famous for its hand weaving. Overnight at hotel in Luang Prabang. We take a drive to Ban Hatkang Village where we start our trek through jungle following hunting paths that offer a rare insight into the unique culture and nature of the Pha Theung Area. A picnic style lunch will be served on the trail. Accommodation based on 2 persons/room as mentioned in the program. The private English speaking local guides during the tour. Private boat trips as mentioned in the program. Other services that are not clearly mentioned in the "Price includes". 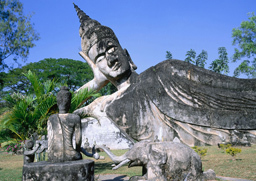 Stretching out on the north-eastern bank of a Mekong River bend, Vientiane reserves a great number of wonders. The city used to be capital of the Kingdom of Lan Xang literally “Million Elephants”. Vang Vieng is a small village nestled on the banks of the Nam Song River and surrounded by a landscape of plains, mountain peaks and tranquil rivers. Around Luang Prabang, magnificent natural sceneries abound everywhere: steep mountains, lush jungle, immense river, impressive waterfalls and mystical caves. 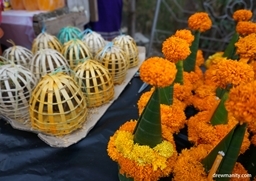 The area is very rich in cultural heritage too. You will experience the daily countryside life, visit ethnic people, take a boat trip along the river and try a bit elephant trekking to experience a real glimpse of Luang Prabang. 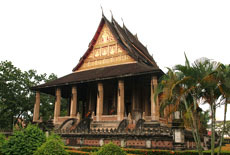 Luang Prabang is the ancient capital of Laos and royal residence of the kings. 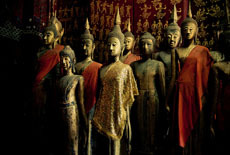 An eventful and sometimes turbulent history has shaped the richness of Luang Prabang that can be found in temples and monuments hidden in its lush settings. It's the rich heritage that earned Luang Prabang reputation of a World Heritage Site recognized by UNESCO.